Changelly, an instant cryptocurrency exchange, has its headquarters located in Prague, Czech Republic. It primarily acts as the mediator/intermediary between the cryptocurrency trading platforms and the user. Even though it is not regulated with any legislative board, it has gained the trust of its customers by partnering with other reputed cryptocurrency exchanges like Binance, Bitrex, Coinpayments, and more. The sole objective of the Changelly Cryptocurrency Exchange is to provide a transparent, simple, quick and user-friendly interface to buy/exchange cryptocurrencies. The trading interface of Changelly is so simple that a novice trader can buy or exchange their desired cryptocurrencies very easily. This Changelly review will analyse several aspects to provide you with an all rounded detailed overview of the exchange and its services. Although Cryptimi does its best to provide you accurate info and to update it on regular basis, we strongly recommend that you to visit changelly.com for any updates which might occur afterwards. Yes. Generally, Changelly is considered a safe place to exchange cryptocurrencies. It protects the account of its users using 2FA (Two Factor Authentication) so that it is almost impossible for the hackers/fraudsters to steal information. Also, it doesn’t store sensitive information like the credit card number, expiry date or CVV on its servers. Additionally, the data entered on the website is transmitted over the secure HTTPS network. Since Changelly Exchange doesn’t provide a personal wallet, users must ensure that they are providing only a valid wallet address in order to receive their coins correctly. Providing an inaccurate wallet address, or one which doesn’t support the coin, might result in loss of funds. Basically, Changelly is a digital cryptocurrency exchange that allows users to convert one cryptocurrency to another. It doesn’t set the price for the digital currencies. Instead, it uses a robot which fetches the rates from other large trading platforms like Bittrex, Binance, Poloniex and displays the best trading rate on the Changelly exchange. This whole process is completed within a few milliseconds. Even though Changelly doesn’t lock the price of the crypto, the rates will remain approximately the same till the end of the transaction. Changelly also has partners with Simplex and allows you to purchase cryptocurrencies like Bitcoin and Ether with FIAT currency like Euro or USD. This feature is not available yet. You will need to set up a wallet on another platform before purchasing cryptocurrency from Changelly. With Changelly, it’s possible to buy Bitcoin (BTC) or other altcoins immediately after creating the account. Navigate to their site and click the green ‘Sign Up’ button located on the top right of the page. Within a few minutes, you should receive a confirmation email from the Changelly team. Click the confirmation link on that email to activate your account. Afterwards, you will receive another email with your login credentials. Navigate to their site and click the ‘Login’ button located on the top right of the home page. 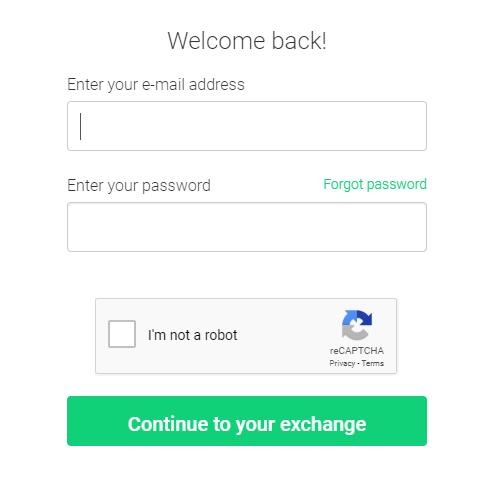 Enter your email address, password (received from the Changelly team) and click the ‘Continue to your exchange’ button after completing the captcha. Don’t forget to remove the default password and set your own strong password to protect your account. To set up a strong password we recommend visiting this site. 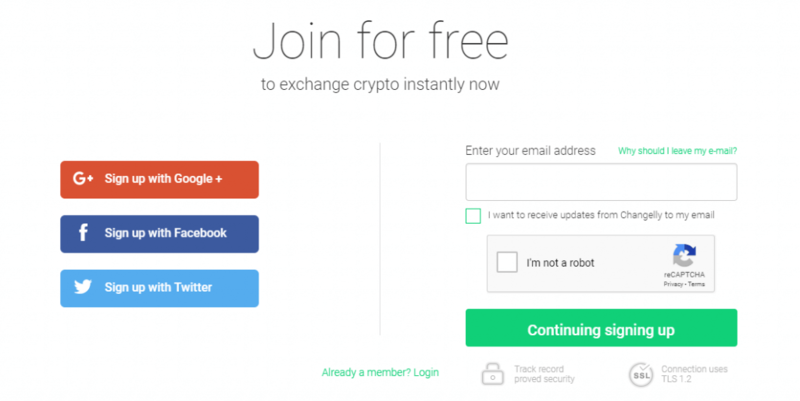 Apart from the email address, Changelly Exchange doesn’t require any other information/documents from the users to buy/exchange cryptocurrencies. Users can buy and exchange digital currencies immediately after creating the account. For exchanging cryptos, there is no need to provide your phone number, whereas purchases made via credit cards requires your mobile number for verification purposes. Additionally, you will be required to provide your personal details and billing address for purchases made via credit cards. Using the Changelly Exchange, users can buy more than 50+ cryptocurrencies including BTC, ETH, ETC, LTC, BCH, XRP, and many more using any fiat currency. Technically, the exchange will convert FIAT currency to EUR or USD for processing the transaction. Apart from purchases using FIAT currency, Changelly also accepts cryptocurrencies as a payment option. It doesn’t charge any hidden fees but deducts a marginal fee of 0.5% for every transaction. 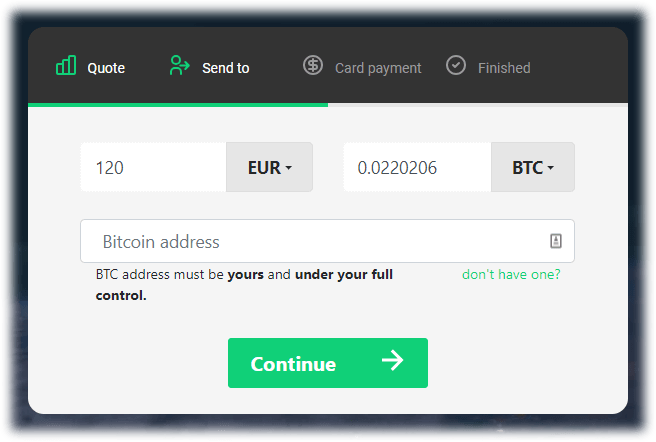 This example explains how to buy Bitcoin (BTC) on Changelly using a credit card. Login to your Changelly account. Select the fiat currency (USD/EUR/GBP) on the left side and BTC on the right. Enter the number of Bitcoins (BTC) you would like to buy or the amount you would like to spend (EUR/USD/GBP). Here, you will also see the purchase limits related to your first few transactions. 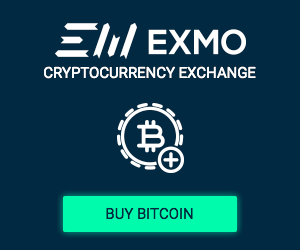 If the exchanges rates are reasonable, click the ‘Exchange!’ button. Enter the receiving wallet address and click the ‘Continue’ button. Next, enter your personal details name, email, phone, billing address and click the continue button. Then, provide the information related to your payment card (card number, expiry date, CVV etc). You must use only cards which supports 3D security. Finally, enter the verification code sent by your bank via SMS or a phone call. Congratulations! You have placed your first order for Bitcoins. You should receive them on your wallet within 5-30 minutes once the transaction gets completed. Make sure you own an Ether wallet, if not visit this site and create one. Select BTC on the left and ETH on the right. Here, you will see all the details related to your transaction like exchange rate, network fee and the estimated interval to receive the digital cryptocurrency. If the rates and fees are acceptable, then click the ‘Next’ button after agreeing to the terms. Enter the recipient wallet address and click the ‘Next’ button. Once again, all the details related to your transaction will be displayed on the screen. Click ‘Confirm and make payment’. You will now see the wallet address of the Changelly exchange to which you have to send your digital currency. You should enter this address for the ‘Recipient’ column on your wallet to send the coins to Changelly. If you have a mobile app for your wallet, you can scan the QR code to insert the address. Once your Bitcoins (BTC) are received by the Changelly, the equivalent Ethereum (ETH) will be sent to the recipient wallet address mentioned in the transaction. Usually, this process takes only 5-30 minutes and you will receive the coins once the transaction gets completed. This example shows how to buy Ethereum Classic (ETC) on Changelly using a credit card. Make sure you have a wallet which supports Ethereum Classic such as the Ledger Nano S, Trezor, or a Coinbase Wallet (For the Coinbase Wallet, navigate to Accounts > ETC Wallets > Receive > Show Wallet). Note that an Ethereum wallet address does not support Ethereum Classic. Select the fiat currency (USD/EUR) on the left and the digital currency Ethereum Classic (ETC) on the right. Enter the number of ETC you would like to buy or the amount you would like to spend (EUR/USD). Here, you will also see the purchase limits related to your first few transactions. If the exchanges rates are acceptable, click the ‘Exchange!’ button. Follow the Steps 4 to 7 mentioned in the section ‘How to Buy Bitcoin (BTC) On Changelly’. This example shows how to buy Litecoin (LTC) using Ethereum (ETH). Select ETH on the left and LTC on the right. Follow the Steps 3 to 6 mentioned in the section ‘How To Buy Ethereum (ETH) Using Changelly’. Once your Ethereum (ETH) is received by Changelly, the equivalent Litecoin (LTC) will be sent to the recipient wallet address you indicated in the transaction. This example shows how to buy Bitcoin Cash (BCH) using Bitcoin (BTC). Make sure you own a BCH wallet. Note that a Bitcoin wallet address does not support Bitcoin Cash. Select BTC on the left and BCH on the right. 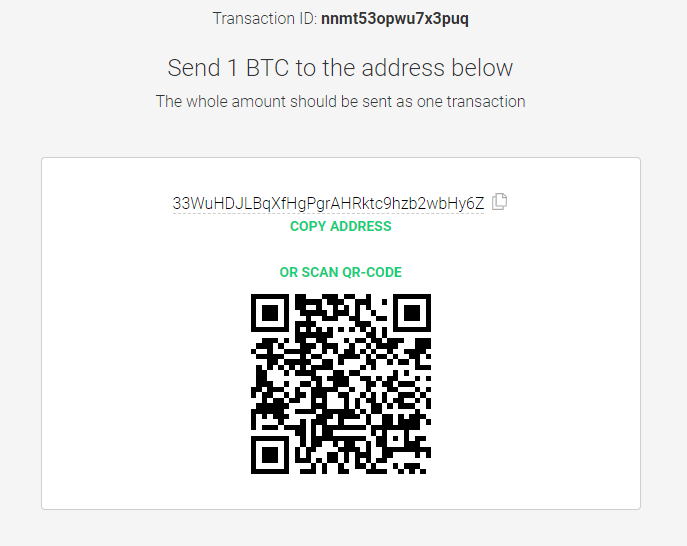 Once your Bitcoins (BTC) are received by the Changelly, the equivalent Bitcoin Cash (BCH) will be sent to the recipient wallet address indicated in the transaction. Unfortunately Changelly Exchange doesn’t allow you to sell any digital currency or withdraw the amount to your bank account or payment card. 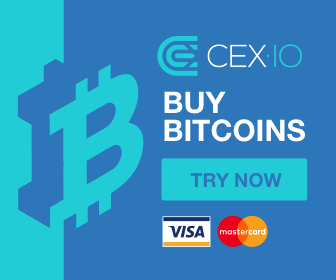 In the instance you want to sell your crypto and withdraw the cash to your bank account, you can do that by using another exchange like Coinbase. Bitcoin (BTC), Ethereum (ETH), Litecoin (LTC), Ethereum Classic (ETC), Bitcoin Cash (BCH), Dash (DASH), Ripple (XRP), Tether USD (USDT), Bytecoin (BCN), Monero (XMR), Cardano, Binance, DigitalNote (XDN), QuazarCoin (QCN), Dashcoin (DSH), Fantomcoin (FCN), Dogecoin (DOGE), NuBits (NBT), Next (NXT), Aeon (AEON), Radium (RADS), MaidSafeCoin (MAID), Factom (FCT), Synereo (AMP), Lisk (LSK), Expanse (EXP), NEM (XEM), Steem (STEEM), Ardor (ARDR), Stratis (STRAT), Augur (REP), Gulden (NLG), Zcash (ZEC), Zclassic (ZCL), Golem (GNT), Waves (WAVES), Qtum (QTUM), EOS token (EOS), 0x Protocol (ZRX), Bitcoin Diamond, Skincoin (SKIN), Icon (ICON), ProCurrency (PROC), Telcoin, Dent (DENT), Bankex (BKX), TrueUSD (TUSD), Smartcash, Hshare (HSR), Nexo (NEXO). Changelly Exchange accepts users from almost all countries in the world including the UK, EU, US, Australia, and Canada. Every cryptocurrency exchange will have its own fee structure and limits. Changelly is not an exception. 5% commission for every cryptocurrency transaction. This is calculated in real time and varies based on the cryptocurrency and the load on the blockchain network. For Bitcoin its approximately 0.00085BTC, Ethereum at 0.00042ETH and Litecoin at 0.003LTC. Not applicable. There is no deposit required to purchase cryptos. Moreover, users cannot withdraw cryptocurrency to their bank account. Important Note. Users must bear the Simplex Fee of 5% (Simplex is responsible for processing the credit card transactions) and the additional Changelly Fee of 5% for buying digital currencies using the credit card. Depending on your geographical location, Changelly exchange has fixed certain limits for the first few purchases made using the debit/credit card. There are no limits for exchanging two cryptocurrencies. There might be some slight variations depending on the FIAT currency you choose. Changelly exchange allows its customers to use any of the payment methods listed below based on their location. To protect its customer’s account from unauthorised access, Changelly Exchange offers 2FA (Two Factor Authentication) using Google Authenticator app. If the 2FA setting is enabled, then any kind of transaction will be completed only after entering the authentication code displayed in the Google Authenticator app on your phone. By default, the 2FA is disabled and users may turn on the option from their profile page. In case you experience any issues with your Changelly account, you can contact their live support by clicking the support link located on the bottom of their homepage. After filling the required fields on the form, click the Send Feedback button to send your query. A representative will contact you within a few minutes to resolve your query. Otherwise, you can send an email to support@changelly.com. Apart from that, you can post your query on their official subreddit r/Changelly on Reddit platform. Changelly exchange is developing the Android-based mobile app for its customers and it will be released very soon. Changelly is also redesigning its website in order to make the interface more user-friendly so that users can swap their coins very quickly. Both Changelly and Shapeshift offer the possibility of instant exchange for a large number of cryptocurrencies without requiring any documentation to verify the identity of the user. Even though many of their features look similar (simple interface, no wallet, no deposit, 50+ altcoins etc), there are some notable differences. For example, Changelly allows users to buy cryptocurrencies using credit/debit cards whereas Shapeshift doesn’t accept fiat-based payments. Regarding the fees, Shapeshift doesn’t charge any kind of fee other than that of mining, whereas Changelly deducts a marginal fee of 0.5% for every transaction. Like Changelly, Shapeshift also accepts members from all parts of the world. Changelly is considered more popular than Shapeshift because it allows even the novice traders to buy Bitcoin (BTC) or altcoins quickly using credit/debit card. Even though both exchanges allows users to buy the top cryptocurrencies, Changelly gets a better rating than Coinmama in terms of the number of cryptocurrencies and payment options. For example, Coinmama lists only a limited number of digital currencies,10, whereas Changelly supports more than 50+ altcoins on its exchange. Also, Coinmama doesn’t accept crypto payments while Changelly provides an instant exchange of a wide range of cryptocurrencies. Regarding the fees, Changelly is more expensive for purchasing cryptos via credit card than Coinmama. Both exchanges accept members from major parts of the world including the UK, EU, US, Australia and Canada. Regarding customer support, Changelly aims to quickly resolve problems faced by its customers via Live Chat whereas Coinmama doesn’t have a chat option. This Changelly review clearly indicates that users can buy/exchange a large number of cryptocurrencies instantly. Thanks to its verification process, which requires no need to upload any documents, is very simple, it takes only a few minutes to buy digital currencies on this exchange. Even though it charges high fees for buying cryptos using fiat currency, the crypto-to-crypto rates are very reasonable. Hence, Changelly Exchange is really a great option for the novice traders to get hands-on experience with cryptocurrency trading. On the other hand, it works well for the professional traders because they can instantly exchange any cryptocurrency without revealing their identity as the transactions are made anonymous. Additionally, it allows them to expand easily their coin portfolio. The only thing missing in Changelly is the mobile app, which will really help the users to buy cryptos on the go, and a wallet system.